This one was overheard at a business meeting. It is a nice conflation of “get your ducks in a row” (get well-organized) and “don’t put all your eggs in one basket” (don’t risk everything on one venture). 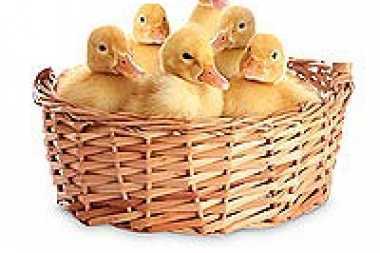 Idioms containing the words eggs, ducks, or baskets seem to get commonly jumbled. Type any one of these words in the search and you will find many postings on the subjects. A big thanks to John Hatfield III for hearing this one and sending it in. The submitter was out with some friends for dinner when this was suddenly uttered. An instant malaphor alert went off. This is a nice, alliterative congruent conflation (best kind of malaphor, imho) of “send shivers up (one’s) spine” and “makes (one’s) skin crawl”, both meaning to cause to feel frightened or unnerved. Spine and skin are mixed here, and the visual of shivers crawling. Certainly your skin shivers when you’re cold, so the mixup is quite expected. A big thank you to Steve Grieme for hearing this one and passing it on!